- Now here is a ring to celebrate your inner Goddess! Wear it every day to remind yourself that you are a magical being, right down to your fingertips. 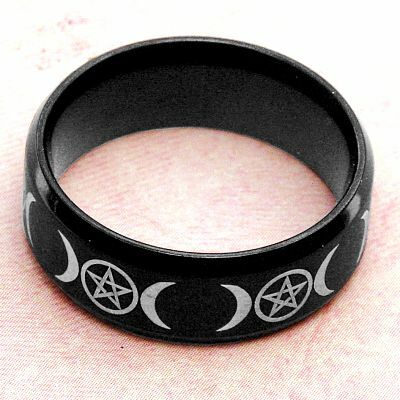 The stainless steel ring has been given a durable jet black matte finish, encircled with a repeating pattern of triple moons and pentagrams. The triple moon, or triple Goddess symbol, stands at the heart of many pagan beliefs. The waxing crescent represents the Maiden- a woman in her youth, whose life is ruled by new beginnings, unharnessed energy, and the joy of discovery. The full moon is the symbol of the Mother- a time in a woman's life when she can celebrate the fruition of her early efforts. This is a phase of stability and fulfillment. The waning crescent represent the Crone, full of patience and wisdom, and the ability to lead and teach others. As a whole, the Triple Moon symbol captures the essence of feminine energy and power. Within each of the full moons, you will find a pentacle, or pentagram, symbol. Like so many pagan and wiccan symbols, it has multiple layers of meaning. The five-pointed star enclosed by a circle is often used to represent the elements- fire, water, earth, air, and spirit. Alternately, it can stand for the five stages of Life (birth, youth, adulthood, old age, and death). In both cases, the path used to trace the star shape symbolizes the continuity and connection between the extremes. The rounded contours of the Triple Moon Steel Ring allow for a secure yet comfortable fit. The stainless steel band measures 8mm across. Choose Size... Size 7 Size 8 Size 9 Size 10 Size 11 Size 12 Please choose the Size. Do you have any other questions about our Black Steel Triple Moon Ring?